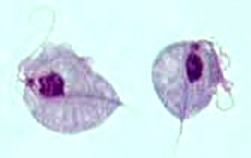 Posted on April 6, 2015 by Anna C.
From creepy crawly pubic lice, which can be seen with a magnifying glass, to minuscule human papillomaviruses, which can be seen with some of the most expensive microscopes in the world, there are many tiny pathogens that we can acquire through sexual contact. And, despite their diminutive sizes, some of them work in complicated ways, or tell stories about our origins that would blow you away. Let’s learn some amazing facts about three sexually transmitted bugs! Fans of Charles Darwin might like learning about pubic lice, which offer clues about human evolution. 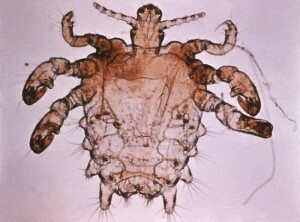 While other apes’ bodies are habitat to only one species of louse, human bodies can host three different types of louse: head lice and the closely related body lice, as well as the distantly related pubic lice. It is thought that when early humans lost their body hair, human lice followed this receding hairline and migrated to their heads to become head lice. At a later date, the gorilla louse colonized early humans’ pubic regions. Since pubic lice can be transmitted by infested bedding, one idea is that an early human caught pubic lice by sleeping in a burrow that had been recently vacated by a lice-ridden gorilla — no sexual contact required. By examining the number of differences in the genetic codes of the modern gorilla louse and the human pubic louse, we can place their divergence into two separate species at about 3 million years ago, suggesting that our human ancestors lost their body hair at around that time.